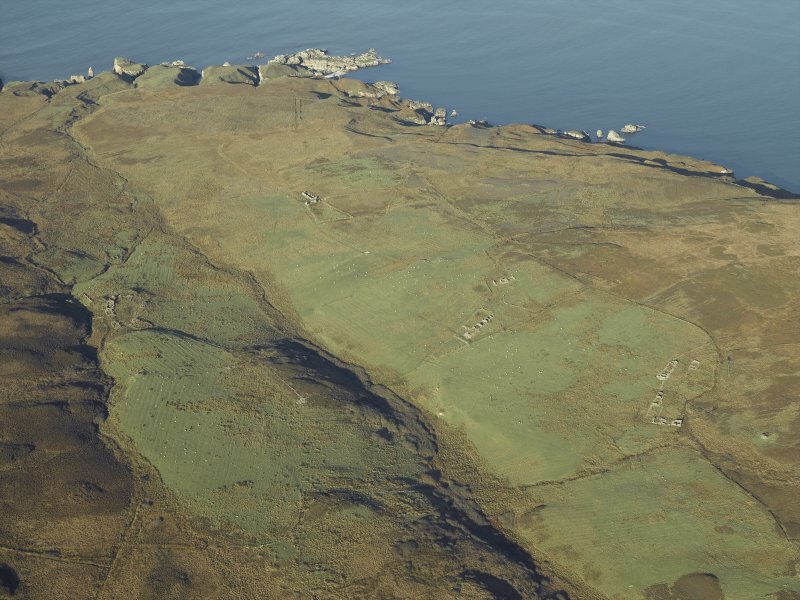 General oblique aerial view of the remains of the field systems and famsteads at Sruthan Poll Nan Gamhna, Islay, taken from the ESE. 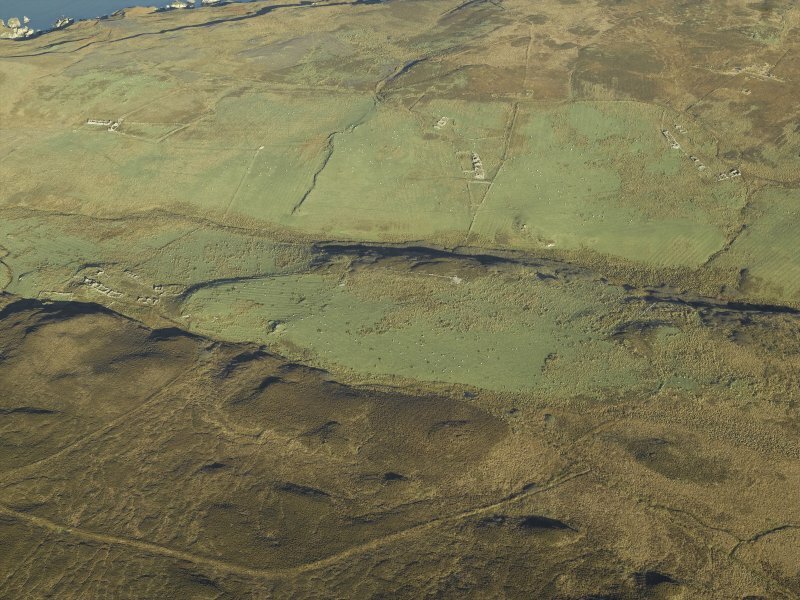 General oblique aerial view centred on the remains of the farmstead, chapel, enclosure, townships, rig and lazy beds, taken from the ESE. 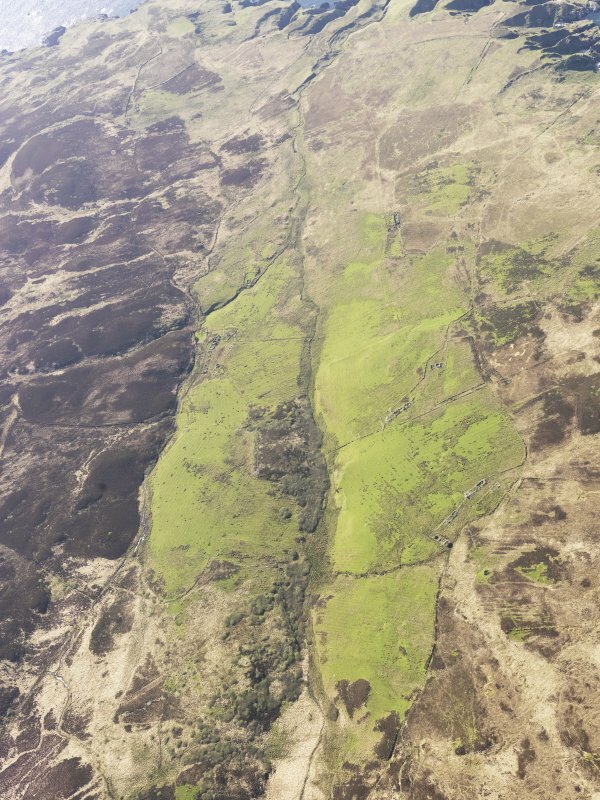 General oblique aerial view centred on the remains of the farmstead, chapel, enclosure, townships, rig and lazy beds, taken from the SSW. 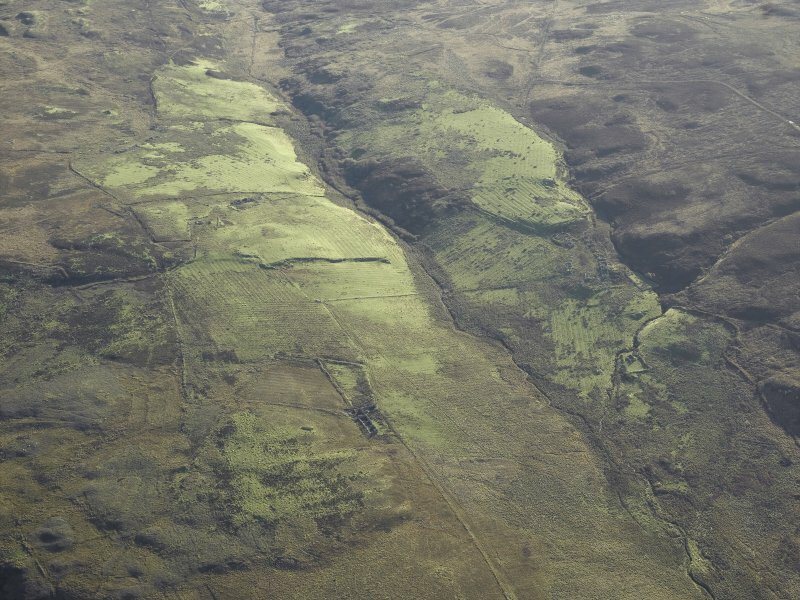 General oblique aerial view centred on the remains of the farmstead, chapel, enclosure, townships, rig and lazy beds, taken from the WSW. 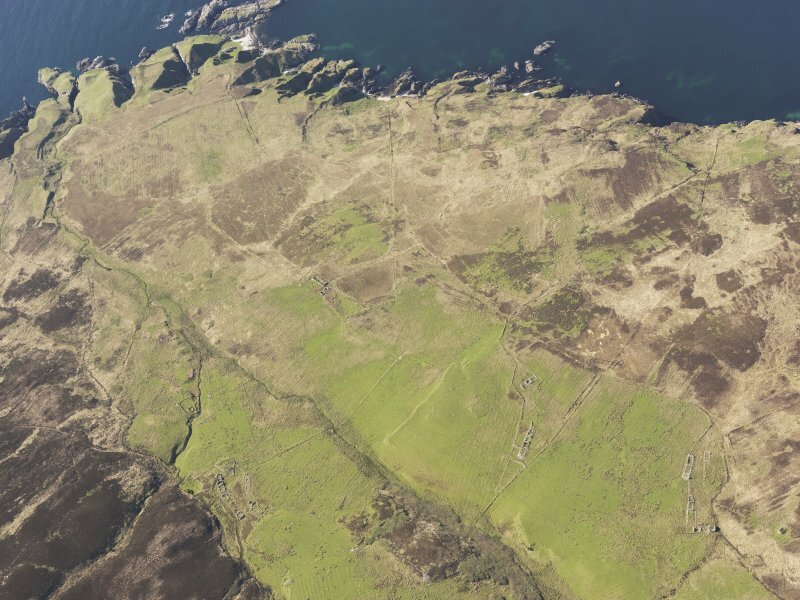 General oblique aerial view of the remains of the field systems and farmsteads at Sruthan Poll Nan Gamhna, Islay, taken from the NE. 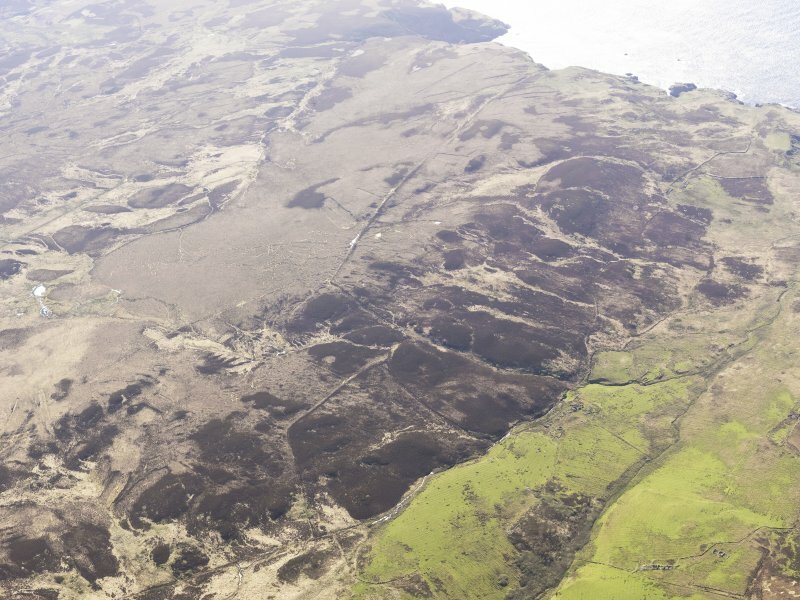 General oblique aerial view of the remains of the field systems and farmsteads at Sruthan Poll Nan Gamhna, Islay, taken from the SSE. 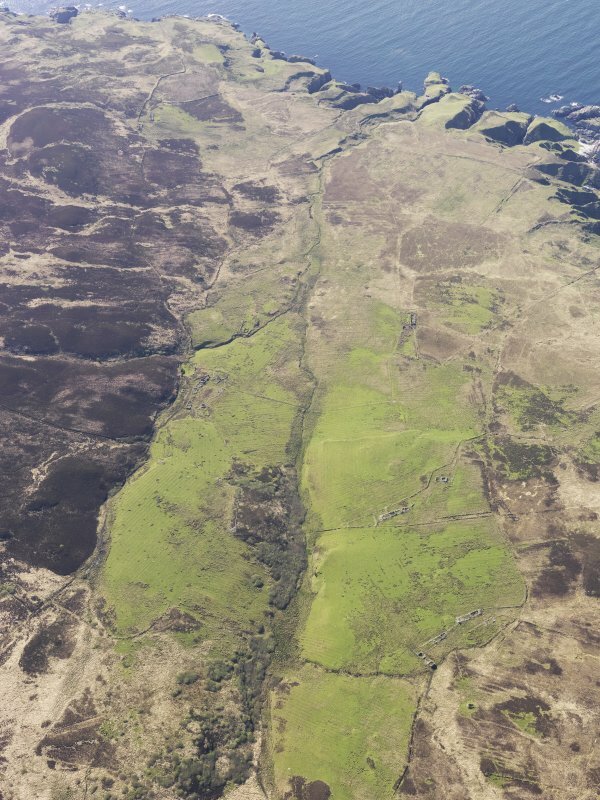 General oblique aerial view centred on the remains of the farmstead, chapel, enclosure, townships, rig and lazy beds, taken from the NNW. 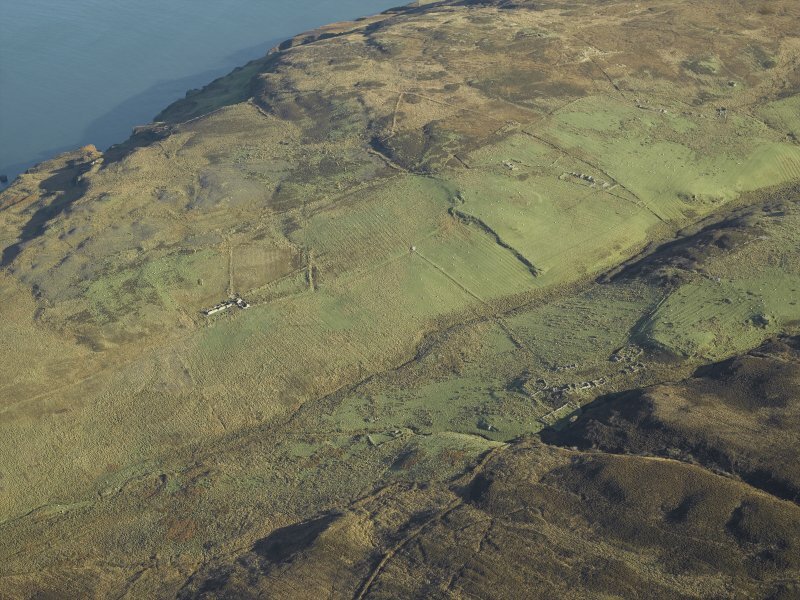 General oblique aerial view of the remains of the field systems and farmsteads at Sruthan Poll Nan Gamhna, Islay, taken from the ESE. 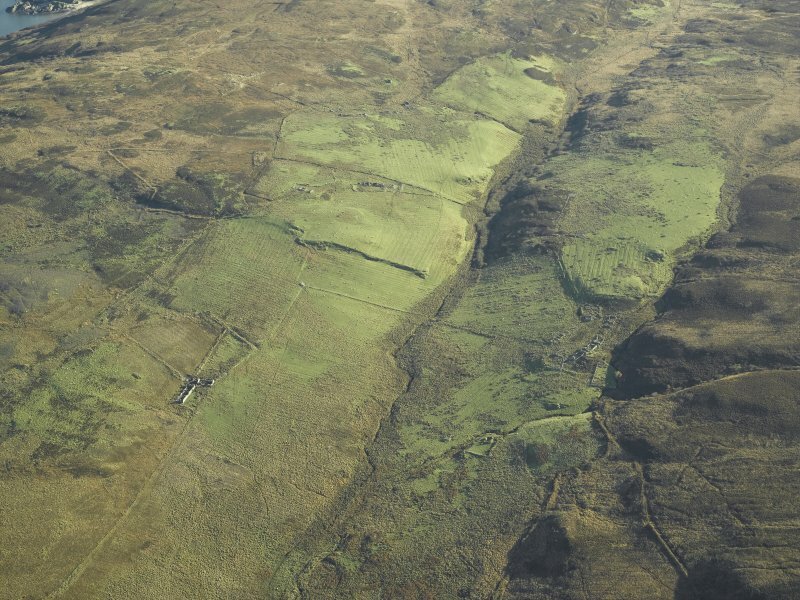 General oblique aerial view centred on the remains of the farmstead, chapel, enclosure, townships, rig and lazy beds, taken from the N.
General oblique aerial view centred on the remains of the farmstead, chapel, enclosure, townships, rig and lazy beds, taken from the SE. The remains of a Medieval chapel, 18ft by 12ft,lying within an irregularly shaped burial ground measuring 85ft by 35ft to 50ft. On the NE side of the burn and some 35 yds north of the chapel is what looks like the ruin of a very rude little chamber, the foundation of the NW 'gable' being natural outcrop. This may have been the priest's cell. The plan of the burial-ground as shown on the OS 6" is not correct. 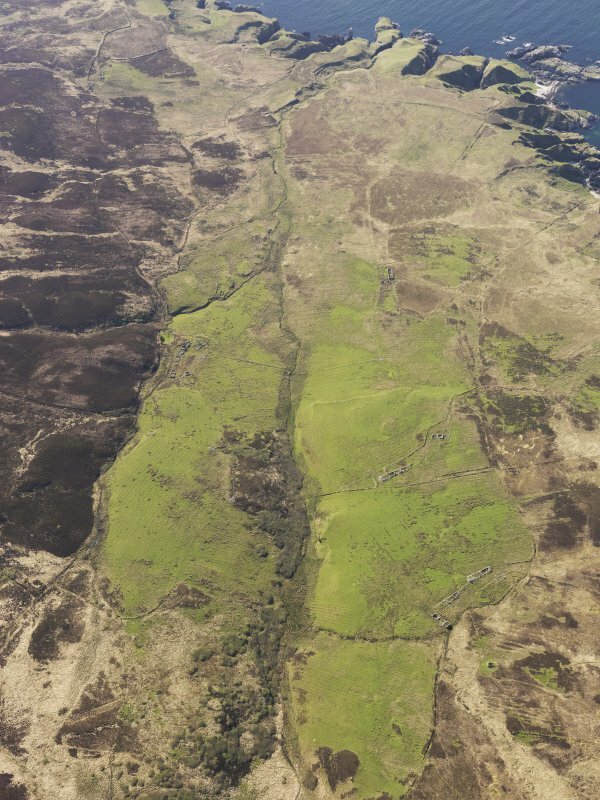 Despite the modern dykes which have been added, the remains show that the enclosure is an imperfect rectangle. The site of the 'Priests Well' shown on the OS 25" is unsuitable for a well, but in the burn itself, a few feet away, three large stones are arranged to form a pool which was probably used for drawing water (information from W D Lamont letter, 2 October 1957). F Celoria 1959; F Gold 1961; W D Lamont 1972. The remains of a chapel within a small enclosure are situated on a level shelf beside a small stream. It is oriented and measures 8.0m E-W by 5.7m over a roughly coursed stone wall 1.1m. wide and 1.0m high. There is an 0.8m entrance in the north wall. The chapel lies offcentre in a sub-rectangular enclosure measuring 32.0m NW-SE by 18.0m over turf-covered walling 1.2m wide and up to 0.9m high. There is no clear entrance, however the wall is fragmented on the north side. The level interior is featurelss. 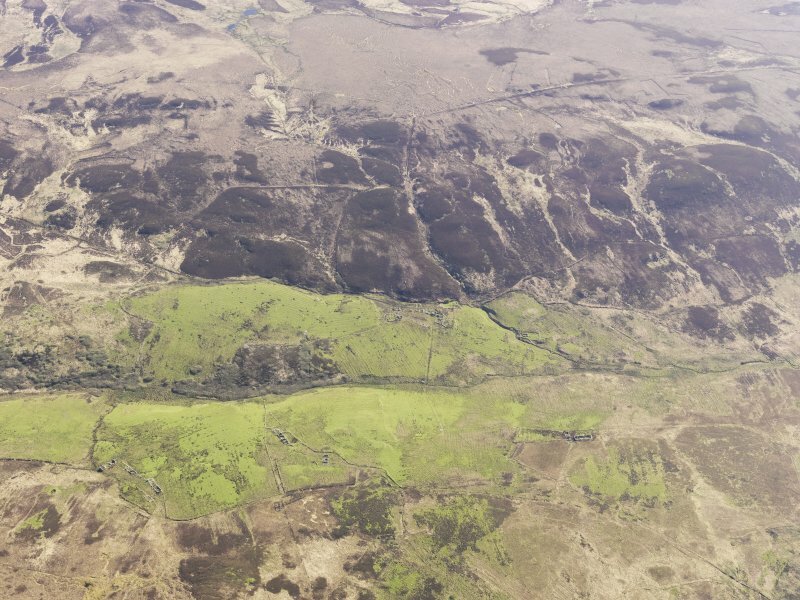 The chamber noted by Lamont appears to be nothing more than recent stone clearance heaped against an outcorp of rock in an area of rig and furrow. Tobar an-t Sagairt (name not verified) was not apparent. Chapel and enclosure surveyed at 1:10 000. Visited by OS (TRG) 29 May 1978. 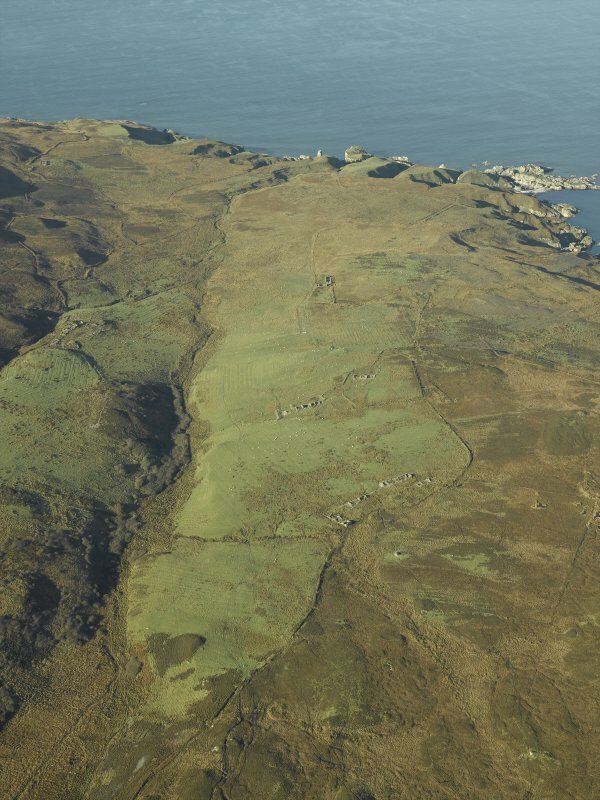 The remains of this small chapel and its enclosure are situated about 100 m NW of the township at Tockmal (RCAHMS 1984, No. 427); they stand on a terrace above the left bank of the unnamed burn that flows through the township. The chapel is round-angled, measuring internally 5.6m from E to W by 3.2m within walls 1.25m in average thickness. 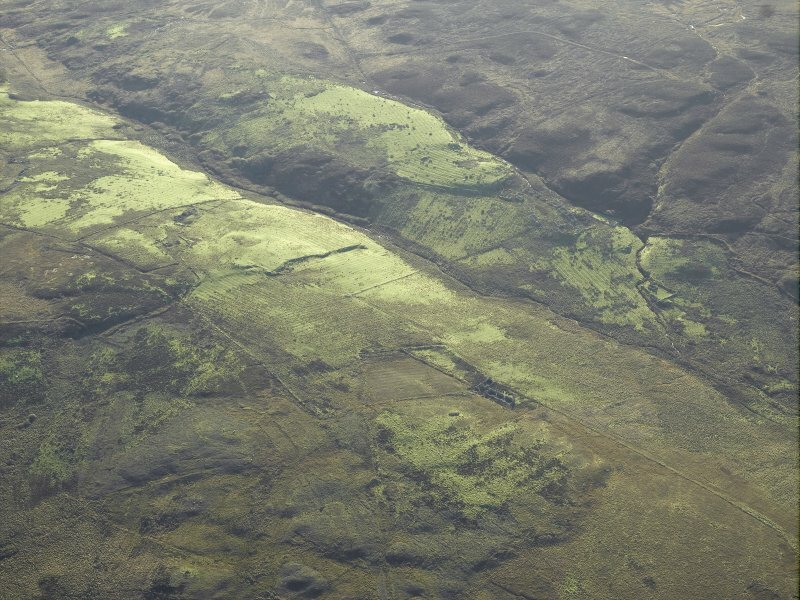 The walls are of turf-covered drystone construction and stand to an average height of 1m. The entrance-doorway is placed towards the w end of the N side-wall, and close to the existing ground-level in the SE corner there is an aumbry 0.3 m high. sides of the enclosure-wall survive mainly as a band of stony debris, and the natural terrace is revetted on the E.
There are no visible remains of the 'Priest's well in the position shown on the Ordnance Survey 6-inch map some 3m from the SE angle of the enclosure, but it may possibly be identified with the ruinous chamber about 32m N of the chapel on the NE side the burn. RCAHMS 1984, visited May 1976.